Banana Wharf bar and restaurant at Port Hamble marina is the perfect spot to meet, eat and drink by the water. The exciting menu mirrors the flagship Ocean Village restaurant blending tropical and oriental dishes with great seafood, traditional favourites, pizza, pasta and a fabulous breakfast selection. In the Banana Bar you will find a variety of drinks to suit any occasion, from a coffee over breakfast, a quick beer after work, through to fine wines to accompany dinner. With a large heated and covered terrace area for dining with unobstructed views of the world famous river Hamble, Banana Wharf is the perfect spot to meet, eat and drink by the water. Parking is free in the Marina but is limited at weekends. If you do struggle to find a space, use the Hamble square or foreshore car park located at the bottom of the high street. There is a convenient pathway to Port Hamble Marina. Monday - Friday open from 9am for breakfast. Takeaway service is available on collection. This restaurant has a big menu with a lot of selections. I had a roasted chicken breast entree and others at the table had dishes ranging from pasta to whole roasted sea bass. There were a number of wines available by the glass as well. The best part of the meal was dessert. Most of the table shared a giant chocolate fondue. They brought mountains of fruit, cakes, etc. to dip and even brought more when we ran out. My favourite, though, was the banoffee pie. It was outstanding and had a beautiful presentation. a lovely riverside bar with a great menu have eaten here a few times and can honestly say it si well worth a visit. Have visited the Southampton branch several times so decided to give the Hamble one for a change. The setting was lovely for a sunny evening. Spent time choosing which boat we would like! I had the vegetable noodles which was sadly overcooked and not as nice as I've had before. The maple syrup crepe for pudding was lovely though and I would definitely recommend! Service was ok, seemed to be plenty of staff working especially considering it wasn't the weekend. We were visiting friends who live at the marine and came here for Saturday night diner. As there was a sailing event earlier that day and the weather had finally improved, there was a lot of activity in the marina. This added to a pleasant and lively atmosphere. We all skipped starters and went straight to the main. Service was good and the staff extremely friendly and helpful. It was a good experience. We regularly visit this restaurant and have been for the last few years. During that time we have never had a bad meal. The food is always great and the staff are friendly and Welcoming. We have never had to wait for a table, the food is always surprisingly quick and tastes delicious. We particularly enjoy the desserts that are made fresh to order. The staff are great, Christina regularly serves us. She always gives us a table near the window so we can enjoy the amazing view of the river. Regardless of how busy the restaurant is she is always attentive and really makes our visit special. 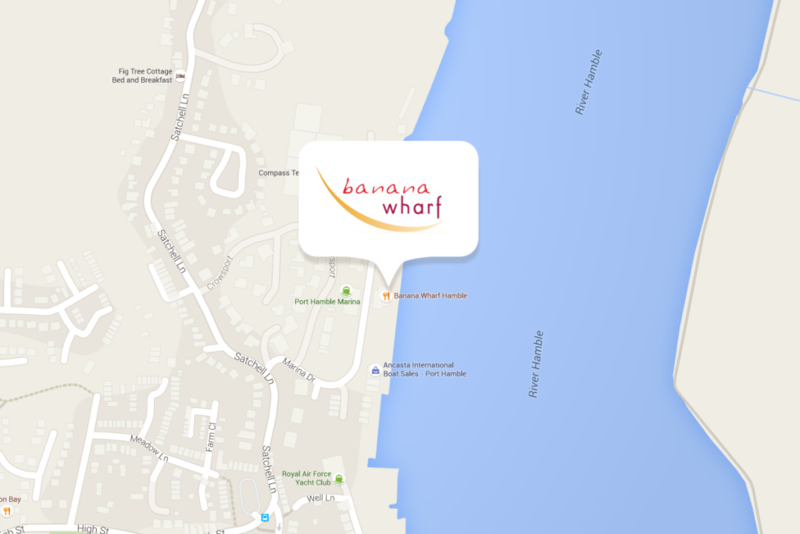 We regularly recommend Banana Wharf Hamble to our friends and family, and intend on going back again soon. Lovely restaurant/bar set right on the edge of the river Hamble in a marina.Good range of food at a reasonable price.Sit out on the patio area and watch the boats going up and down the river.Gets very busy so booking is a must ,especially when the weather is good.Parking can be busy here.